Working for 45 years is a big deal. That’s a lot of years in the rear view mirror. By age 60, working people are often tired; by 65 they are downright exhausted. It’s especially hard for people who have spent those 45 years on their feet. Martha is one such person, a delightful woman who cannot wait for her 65th birthday to come in December. She has the biggest smile and warmest way about her and is totally serious when she says that she is just plain done with work. Her philosophy is that retirement doesn’t have to be fancy. She just wants to retire! Martha has worked various jobs in a hospital system near a large city for her entire career. It’s been demanding and the schedule tough. It’s always about patient care first, and that’s the way it must be. However, this kind of focus and dedication takes a toll on those caring for patients. For 45 years, Martha has taken a back seat to care for others over her personal well-being. So, it’s no surprise that she is tired. Yet, her smile is very big when she talks about retiring at the end of the year. She loves everything about the idea of retirement, the freedom and the choices. Martha wanted to retire a couple of years earlier, but she couldn’t afford the high cost of health insurance. She knew she had to keep working until 65 to be eligible for Medicare. As a result, these last three years have been tough, enduring high stress and high impact on her body. She suffered a heart attack a year ago. Martha sports a long scar from just below her collarbone to partway down her rib cage due to the life-saving heart surgery. Fortunately, she worked at a hospital and those around her jumped right in to assess her situation. She worked in a community hospital, but her needs quickly became more than the facility could handle. She was med-flighted in a helicopter to the main hospital, landing on the roof of the building. After surgery and recovery time, she is doing just great. That experience made her decision to retire right at 65 even more solid. She recognized that she has not reached her Social Security “full retirement age” (FRA) yet, so she knows she’ll be getting a slightly reduced amount monthly income. It’s worth it to her. She just wants out of the intense work place environment and to have time to enjoy every new day. Her retirement won’t be fancy. 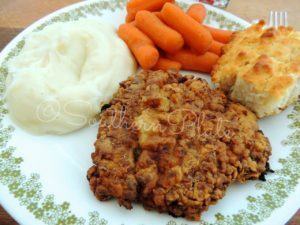 In fact, Martha says, “I just want some victuals on the table. I only need the basics.” She is looking forward to relieving her stress level and enjoying her home. She is very close with her older sister who lives in a nearby town. Her sister is a year older than Martha. The sister team is navigating their retirement era together. It’s great fun to try new things together, and it’s both emotionally and financially important. It’s likely that Martha will get a low-key, part-time job doing something different and not nearly as taxing. She wouldn’t mind bringing in some extra income to give her a little safety cushion. She loves to read and her favorite social activity is line dancing. Martha has made many new friends by going to the local clubs, kicking up her heels, and dancing to country music with hundreds of other folks of all ages. And, an added bonus — getting great exercise as well. All good from Martha’s perspective! After 20 years of marriage and then a divorce, she enjoys her peace and quiet in her own home. Though she’s planning for a modest retirement, she was very interested to learn that she may be eligible for more Social Security income than she thought. During the divorce she thinks she may have waived her right to claim spousal benefits on her ex-spouse’s wage history. But, according to the Social Security Administration (SSA), a lawyer cannot stipulate a reduced income from Social Security and any such “agreement” in a divorce decree is not enforceable. Martha will need to make an appointment with the SSA’s local office and bring appropriate documents to prove the marriage and subsequent divorce. It’s the SSA that will look at her claiming options and determine how she can get the most income possible. Since her “ex” always made a great deal more money than she did, it’s likely that her spousal benefit will provide a substantial amount more in income for her. She will still have a slightly reduced monthly pay from Social Security, since she is claiming early, but overall, Martha should have some new-found income. In the case of Social Security benefits, more is more. You are entitled to receive the highest amount of income that you qualify for. And sometimes, that means your claim is on your ex-spouse. Maybe now, with more income than she expected, Martha will even get some cowgirl boots to wear when she’s line dancing! Yes, retirement at 65 is just what this hardworking lady is looking forward to. Perhaps it’s time to really think about your retirement. What will you do with all of your new found free time? Try filling out this worksheet. You might be surprised how many options you have available. 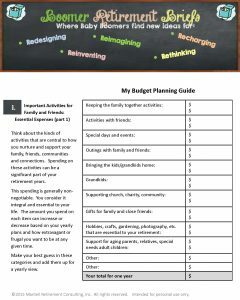 Your Budget Planning Guide is a great place to start thinking about all your will do in retirement and how much it will cost. Get some good ideas for how to go about retiring early from Time Magazine. Even a couple of years can make a big difference to your lasting pleasure. Ready to kick up your heels and learn to line dance? There are places all around the country. Just google “line dancing near me” and the local spots will pop up. Who knew Boston was a line dancing mecca? 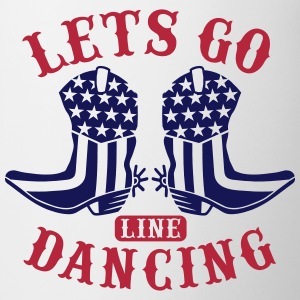 I might just have to persuade my hubby to give line dancing here in Boston a try with me! « Thanksgiving Parade Surprise: Baby Boomer Drum & Bugle Corps Members!